Versailles’ Jake Poling (6) runs away from a pair of Coldwater defenders during their Midwest Athletic Conference game Friday night. Poling scored the Tigers only touchdown in a 35-7 loss to the Cavaliers. 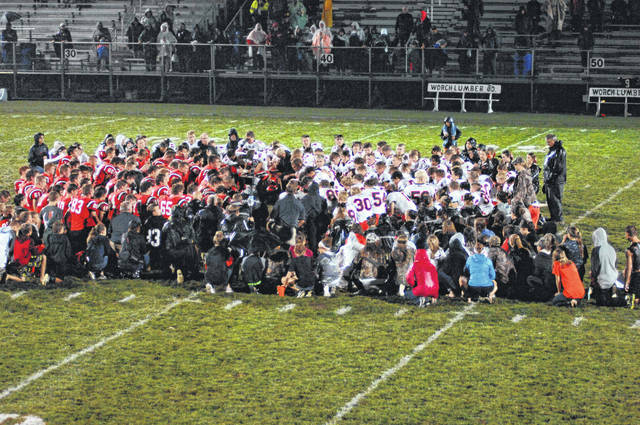 Players and students from Coldwater and Versailles gathered at midfield to pray for an injured Coldwater player following their Midwest Athletic Conference football game Friday night. Shane Homan was injured last week in a junior varsity game and required surgery to repair a fractured vertebrae. Versailles’ Nathan Wagner (25) tackles a Coldwater running back during Friday night’s game at Versailles. The Cavaliers won the battle 35-7. Versailles quarterback Ryan Martin (11) looks for some running room against Coldwater on Friday night. Coldwater defeated Versailles 35-7. 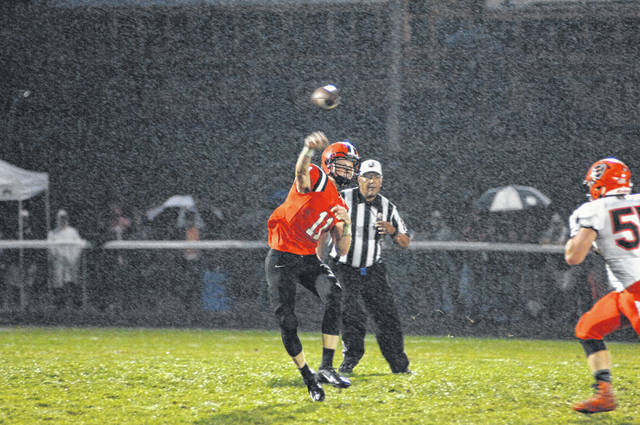 Versailles quarterback Ryan Martin (11) throws a pass against Coldwater on Friday night. Coldwater defeated Versailles 35-7. 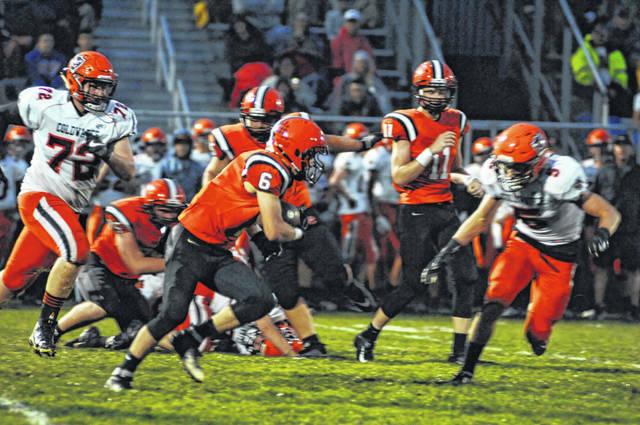 VERSAILLES – The Versailles Tigers played gracious host to the visiting Coldwater Cavaliers Friday night. 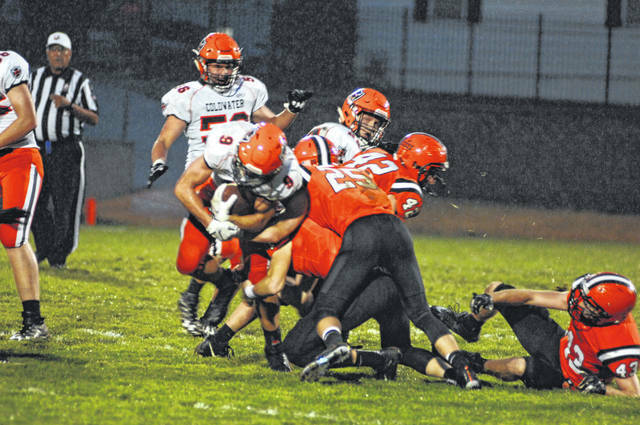 The Tiger football team lost 35-7 in a steady rain. Off the field, both teams were winners as the Tigers raised funds for injured Coldwater player Shane Homan. Both teams and many students gathered at midfield after the game and prayed for his recovery. Homan was injured in a junior varsity game and required surgery to repair a fractured vertebrae. The Tigers started the night doing some good things offensively. The running game was efficient early in their first drive and a pass to Derek Cavin had the Tigers with a first-and-10 at the Cavalier 30-yard line. The Cavalier defense stiffened though and the Tigers turned the ball over at the 23-yard line. The Cavaliers wasted no time moving down the field, scoring on a 6-yard pass halfway through the first quarter. The Tigers offense sputtered for most of the game after the initial drive. 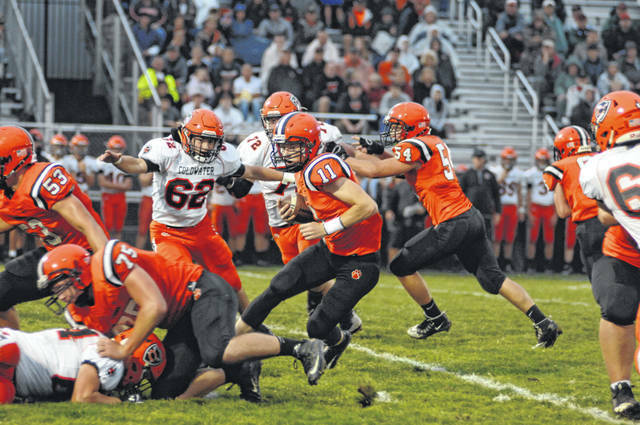 The Tiger defense did what it could to contain Coldwater’s high scoring offense, but could not shut them down. The Cavaliers were held scoreless the rest of the first quarter. Coldwater scored on the first play of the second quarter on a 25-yard run and would take a 28-0 halftime lead. The last score of the half happened with 38 seconds left. The Cavaliers scored in the third quarter to take a 35-0 lead and start a running clock. The beginning of the fourth quarter saw some JV players enter the game. The Tigers Jacob Poling was able to stop the running clock with 3:08 left in the game. The Tigers will play Parkway next Friday night. The Panthers lost 51-7 to Marion Local Friday night. This entry was tagged Coldwater Cavaliers, Jake Poling, MAC, Ryan Martin, Shane Homan, Versailles Tigers. Bookmark the permalink.